The packs and gift sets that Sephora comes out with never seem to astound me. They are such incredible value and always seem to come out with the best things! Whilst their exclusive Christmas sets all look absolutely amazing, I'm lusting after the Sephora Favorites Give Me Some Lip Lip Sampler set. "This essentials kit has all you need for luscious lips (including two full sized products). 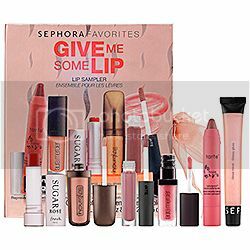 A multi branded lip kit featuring the best lip gloss from Bit, Fresh, Hourglass, Laura Mercier, Sephora Collection and Tarte, Give Me Some Lip is valued at more than $79. It's the perfect gift or treat for yourself." It sounds incredible, right? Yes! I've wanted to try Fresh Sugar and Tarte lip products for a long time now so this set from Sephora would be the perfect way to go. This set retails for $25.00. Argh. I simply can't get over that value, it's insane! Eek, if only I lived in the US. Speaking of which, if you're in the US, or know someone that is, please let me know - I'd love to be involved in a swap. So, please tell me, have you tried any of the products in this lip sampler kit? Have you tried any of the brands, especially Fresh and Tarte? I'd love to hear your thoughts. As always, what has made it onto your list this Want it Wednesday? I know what you mean though. I wish we had one here. Oo, really? That's good to hear, although it makes me want it even more! I'm not entirely sure whether this is an actual Christmas set but I could be wrong, I don't know my Sephora information all that well. It looks great though, doesn't it? if only we lived in US... wah! so good. Oh I know, I know. Wahhh! are u looking on tarazz ? its $27 but shipping is like $22 within australia. so would be $50 for the set shipped. I've looked on there, yeah, but their shipping is ridiculous. I think it will almost be cheaper to use a redirection service. Fingers crossed they reduce their shipping fees in time!